"Toto, I don't think we are in East Somerville anymore," I remarked to Steve as we entered the dimly lit dining room of La Brasa. There are exposed brick walls, beamed ceilings and long wooden tables. It felt like we stepped in to the South End. Except here, there is easy parking, plenty of room to navigate around your table and the prices are 20% less. We get seated for our 8pm reservation and a trolley o' meat comes rolling over. She is offering rib roast cooked in La Brasa's wood burning oven. It comes with a cilantro chimichurri and is $3.50 an ounce. Despite the obscene $56/lb price tag (it's better when you don't do the math), I cannot resist a taste. Sadly, it was cold, dry and there was no hint of smoke from the fire. 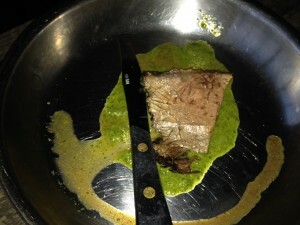 The chimichurri did little to improve the beef. 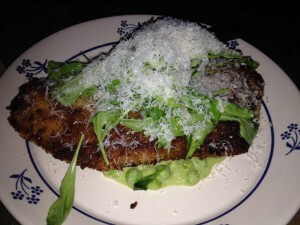 I ordered the La Brasa fried chicken ($17) with escargot- brown butter vinaigrette and Steve had the smoked bone in pork Milanese with mushy peas ($24). 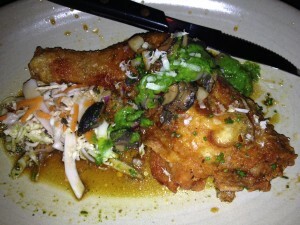 My chicken was twice-cooked, Korean style, resulting in a crispy, crackly crust. The meat was flavorful, although a bit stringy. The escargot seemed to clash with the slightly-too-acidic vinaigrette. Any other day, I would have been happy with my dinner selection, however Steve's pork chop arrived first and it was phenomenally delicious. It was a thick bone-in chop; the crispy breading contrasting with a juicy, succulent bite of smoky pork. I think I literally swooned. I kept stealing bites of his dinner and watched enviously as he gnawed on the bone at the end. I have been talking about the chop for 3 days now to anyone who asks "how was your weekend?" 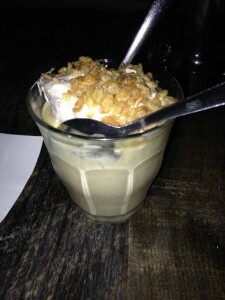 There were only two desserts offered; affogato (espresso poured over ice cream) and butterscotch pudding ($6). The server said the pudding was "rich and light, at the same time," which was an appropriate description. I loved that it was topped with rice krispies for a textural contrast. I will steal that idea for the next time I serve pudding. I had dinner with a friend last night and she wanted to tell me about a restaurant I "have to try," when I started telling her about the pork chop and La Brasa, she laughed and said that was the restaurant she mentioned earlier. Go, order the pork chop, and then tell everyone know you about how good it was.